Indigo is an Award winning film about alienation on the inside - by Swedish director Paul Jerndal - Music by Frida Sundemo - Starring Cecilia Forss and Johan Matton. INDIGO IS AN AWARD WINNING SHORT FILM ABOUT ALIENATION ON THE INSIDE BY PAUL JERNDAL. by Paul Jerndal - Starring Cecilia Forss & Johan Matton with music from pop artist Frida Sundemo. After three years on film festivals receiving 30 international awards - in over 20 countries the little pearl is now free for everyone. Remember to always reflect about your inner emotions. Indigo wants to give everyone feeling alienation on the inside - hope. Love from and to all of you involved. Take a look at the short´Steps for Life´ - about suicide prevention and the Indigo music video version - and listen to the podcast here. Every 40th second someone takes his or her life. You can make a difference. Indigo got it´s 20th Award at CINEMAFEST in San Luis Potosi, Mexico. Paul Jerndal spent a week in the city doing over 20 interviews for TV, Radio and Newspapers. The message of the film was discussed and seemed to affect the people of Mexico. TODAY - 16 International Awards, 12 Nominations and 48 Official Film Festival Selections – in 16 countries. Indigo premiered in its first film festival early April and Paul Jerndal traveled to Los Angeles to attend the QnA and to receive two Awards. 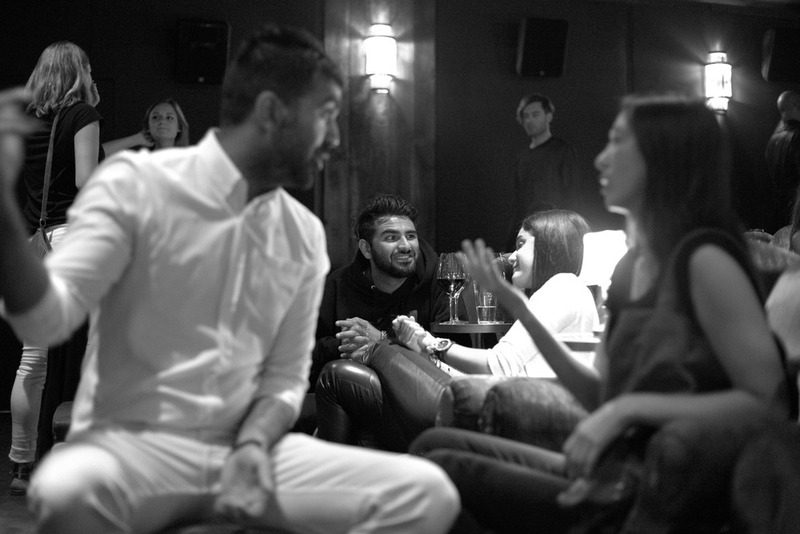 In May, guests from the entertainment industry were invited to the exclusive members club Soho House in West Hollywood for the first private screening of Indigo. In the summer the film reached out to several countries film festivals and received another five international awards. In July, Paul came up with an idea to make the film a catalyst for something stronger – something that could touch a wider audience. The start of this new concept took place in August where Indigo had its Swedish premiere at Way Out West Film Festival in Gothenburg. The success and now Oscar Nominated film Turist (Force Majeure) by Ruben Östlund also premiered at the festival. At Haga Bion Indigo hit the Swedish audience for the first time along with Jonas Åkerlund´s and Coldplay´s short film Magic. The biggest Swedish Newspaper, Aftonbladet, was present for Indigo and the campaign #Otillräcklig (Insufficient) started with Indigo as the core element. For one week Indigo was screened free online to people in Sweden and that marked the start of #Otillräcklig. 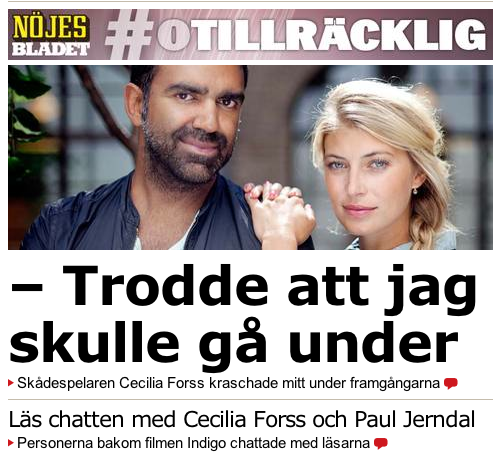 Aftonbladet along with actress Cecilia Forss and director Paul Jerndal started this nation wide campaign to make people "start talk about it". Cecilia and Paul did lots of interviews, wrote a debate article and launched a Podcast where they used their own personal experiences and the film Indigo to help inspire people to reflect and talk more about their inside. Aftonbladet also published ten different stories with Swedish celebrities opening up their hearts and shared their stories about anxiety, self esteem to encourage others to start “talking about it”. Cecilia and Paul then introduced the film to 600 people at Skandia Bion in Stockholm and where interviewed in TV4, Studio1, Radio P4, Aftonbladet, Partiprogramet, Nöjesguiden, Dalademokraten and Dagens Nyheter about the project, the film and their own personal journeys. I’m so proud and grateful of Indigo’s journey and everyone involved. To be a part of the awesome campaign #Otillräcklig was a perfect way for Indigo to play an important role in today’s society with all demands we have on our selves. For Cecilia and I to share our personal stories was of course scary - but we hope that doing this will encourage others to start talk about their inside, to start reflect and stand still for a moment. This film did not have any sponsors or funding – it has all been a passion project. The dream that came trough would not have been possible without all of you guys who contributed in one way or another. LOVE to all of you! 2014.09.21 Indigo "Official Selection" in three new US Film Festivals. After the important nationwide campaign #otillräcklig in Sweden where Indigo was the core element to help people reflect more about their inside - the film has now been invited to three new international film festivals; Hollywood Film Festival, Grenada Afterglow Film Festival and INDIE FEST USA. "This stylish meditation on loneliness and destiny uses opposite ends of the economic and privilege spectrum within the city of New York. A male bike messenger (Johan Matton) and a female celebrity (Cecilia Forss) have similar disconnected and depressed lives, but endure a different kind of existence while experiencing their ennui. There is interesting superficiality that both characters must undergo in their separate worlds, and despite the privileged circumstances of the celebrity, her world seems even more fraught with being alone than the messenger who is practically invisible. 2014.08.23 - Cecilia and Paul interviewed in live nationwide TV shows. TV4 Morning Show "Nyhetsmorgon" interviewed Cecilia Forss and Paul Jerndal about self esteem, Indigo and the "not good enough"-campaign. They were also interviewed in Aftonbladet TV. 2014.08.19 - Indigo, Cecilia and Paul, core in nation wide campaign about alienation on the inside. Sweden´s biggest Newspaper Aftonbladet releases nation wide campaign to make people "start talk about it". 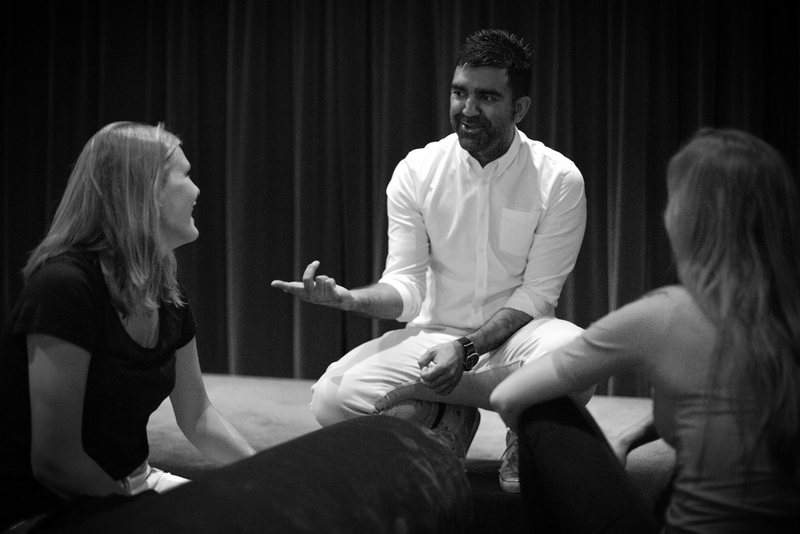 Actress Cecilia Forss and Director Paul Jerndal has a key role in the project with interviews, debate article and the launch of a Podcast where they use their own personal experiences and the film Indigo to help inspire people to reflect and talk more about their inside. Indigo will be official online in Sweden for free. 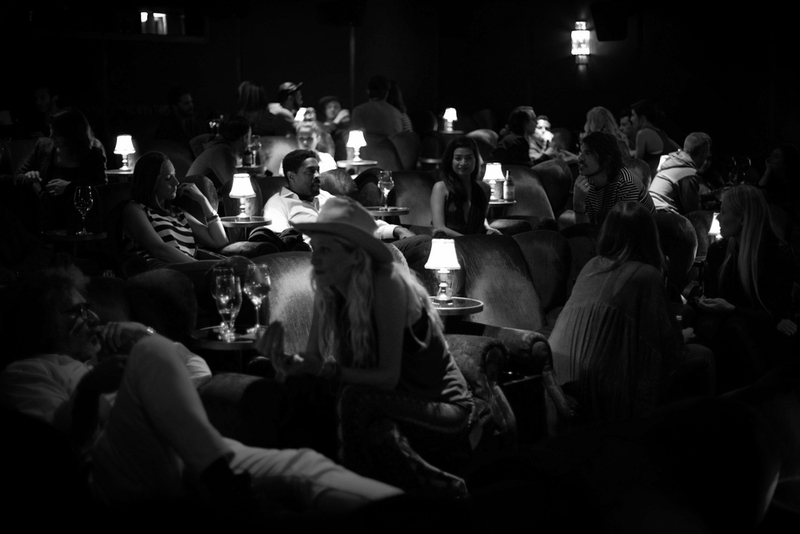 2014.08.19 - Exclusive Screening at one of Europe´s most famous movie theaters. Indigo was screened for 600 people at Skandia Biografen in Stockholm. Paul Jerndal introduced the film and was interviewed on stage together with Cecilia Forss. Colin Nutley and Helena Bergström was present for their screening of Medicinen. Along with Jonas Åkerlund´s premier of "Magic" with Chris Martin from Coldplay - Indigo will have it´s Nordic Premier in Gothenburg, Sweden. The actress Cecilia Forss, pop star Frida Sundemo who did the soundtrack and director Paul Jerndal will attend. REVIEW: "This stylish meditation on loneliness and destiny uses opposite ends of the economic and privilege spectrum within the city of New York. A male bike messenger (Johan Matton) and a female celebrity (Cecilia Forss) have similar disconnected and depressed lives, but endure a different kind of existence while experiencing their ennui. There is interesting superficiality that both characters must undergo in their separate worlds, and despite the privileged circumstances of the celebrity, her world seems even more fraught with being alone than the messenger who is practically invisible. Beautiful imagery of New York city becomes a distinct character unto itself, while theindigo of the title refers to the deepest depth of midnight blue that the characters suffer. Each are searching for redemption, but can their psyche live up to that promise?" 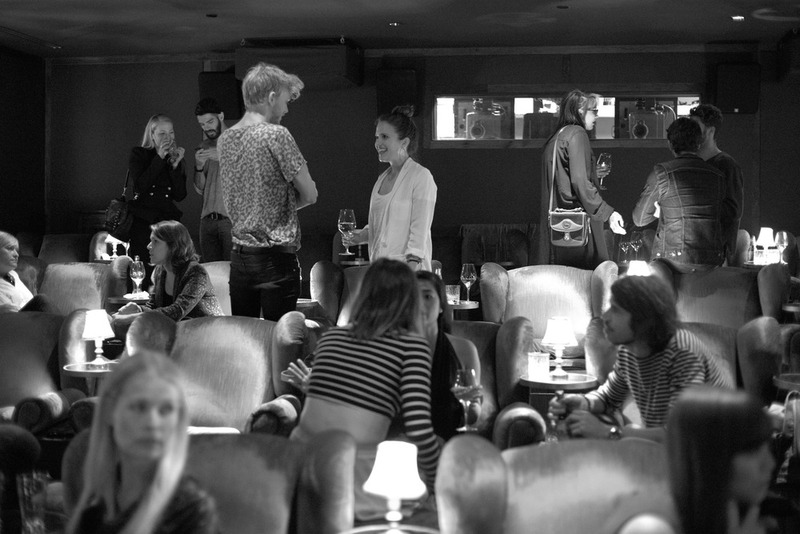 At the members club Soho House, West Hollywood in Los Angeles an invited audience gathered for the first screening of Indigo. In the private cinema people from the industry was introduced to film by director Paul Jerndal who talked about the importance of reflecting about your inside. 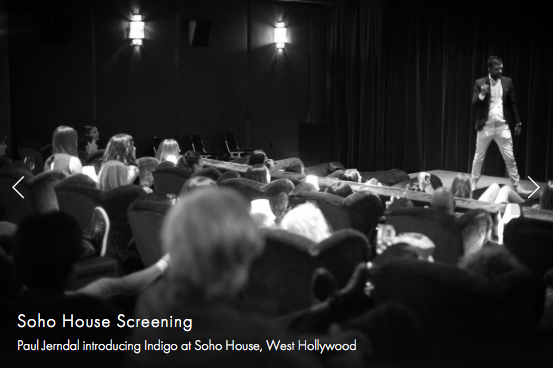 Exclusive Screening of Indigo at SOHO HOUSE West Hollywood. Indigo has won 30 International Awards, got 16 Nominations and over 100 Official Film Festival Selections – in 23 countries. "GOLDEN CINE - WINNER" Headline International Film Festival 2017 "THE PINNACLE AWARD - WINNER" The Elevation Indie Awards "BEST SOUNDTRACK - WINNER" and "BEST CINEMATOGRAPHY-WINNER" WILDsound FEEDBACK TORONTO FILM FESTIVAL "BEST FILM" - WINNER" River Bend Film Festival, Indiana US 2015" STEPHEN SUSCO AWARD" - WINNER. River Bend Film Festival, Indiana US 2015. "BEST NARRATIVE SHORT - WINNER" Los Angeles Film and Script Festival,US 2014 "BEST EDITING - WINNER" Feel the Reel Festival, Glasqow 2017. "BEST SHORT WINNER" Near Nazareth Film Festival "BEST DRAMA/THRILLER - WINNER - ShortFest International, US. Paul Jerndal in the QnA panel and on Red Carpet receiving "Best Narrative Short Award" at Los Angeles Film & Script Festival 2014. Indigo premiered at Los Angeles Cinema Festival of Hollywood - Actress Chloe Hurst and Director Paul Jerndal on red carpet.